You are Princess Lerione, heir to the throne of the kind Queen Alura, and you've at last come of age! What should have been a joyous occasion quickly takes a dark turn as you're pulled into the Shadow World. Your mother's once dark past is threatening to become your future. Your mentor, the wise wizard Lucio, has given you an artifact that can send you home, but it is up to you how you will use it, for good or for evil. With it, you will determine the ultimate fate of the worlds of Light and Shadow! Will you stand with the forces or light, or fall prey to the darkness lurking within, as your mother once did? 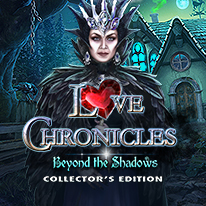 Find out in this spine-tingling hidden object puzzle adventure! - Play as Sebastian the Cat in the bonus chapter! - Collect morphing objects and statues to learn more about the characters! - Remember your journey with wallpapers, soundtrack, and exclusive concept art. - Never get lost with the included strategy guide.